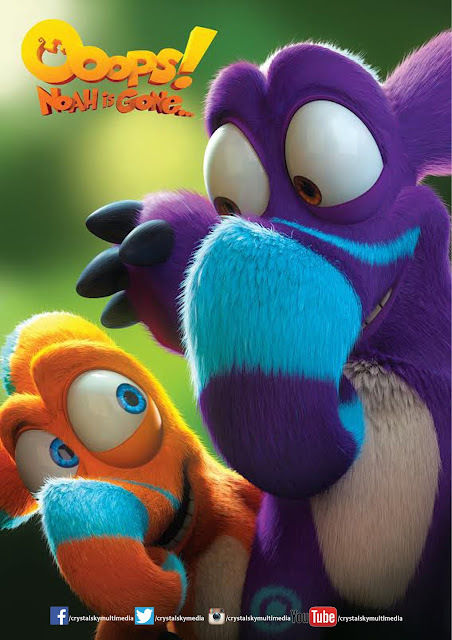 A fun-filled adventure for the whole family, “Oops: Noah is Gone” is a film that deals with family,acceptance, friendship, and peaceful coexistence. It was a delightful film that the whole family will surely enjoy. The wonderful animation is reminiscent of the best 3D animated films. The color and forms, movements and musical score of “Oops: Noah is Gone” is beyond what we expected to see. The story line is unique and the perfect mix of fun, action, adventure and drama will surely touch the heart of everyone. What we like about this film is that the humor is something that could be used to tell moral lessons to your kids. The story of the film is a good starting point of conversations for the family on how to deal with issues like how to make friends, moving houses, and even racism. A visual treat for anyone who wants to treat their kids and friends to a family-friendly movie this coming weekend, “Oops: Noah is Gone” is a highly recommended film to see. “Oops: Noah is Gone” is about Dave and his son Finny who belong to a strange species called Nestrians. They are clumsy and weird looking animals that seemingly is not really good for anything at all, in fact, they’re not even allowed on Noah's ark. But with a sly trick and with the involuntary help of two carnivorous Grymps, Hazel and her daughter Leah, Finny and Dave manage to smuggle themselves on board. But then the ark leaves and Leah and Finny are accidentally left behind. The unlikely duo has to escape the raising waters and save themselves from a mean and villainous couple of Griffins. Along the way they meet a pair of even weirder creatures who were also rejected from the ark and take them along on their perilous journey. The parents who stayed on board the ark do everything in their power to turn the boat around and save their kids. After an action packed showdown our clumsy Nestrians discover their true destiny. Sometimes you have to face the end of the world to find your place in it!